Unlike so many of the posts on this Blog, this one is just for the parents. 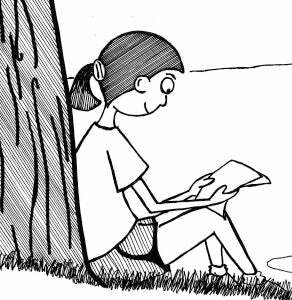 Last week I posted three ways that you can do to alleviate your concern for your child’s upcoming summer camp stay—or ‘childsickness’, as summer camp experts Chris Thurber and Jon Malinowski call it in their preparatory guidebook, ‘The Summer Camp Handbook’. #1. Get News from Your Kid’s Cabin Leader. It can be very comforting for parents to keep in touch with cabin leaders and get word about how their kid is doing. 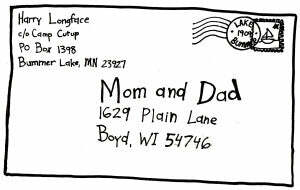 Leave some stamped postcards addressed to yourself with your kid’s cabin leader and ask them to send an update here and there so you know how things are going. It’s cool for a kid when parents find fun, creative ways to connect with their kid while they’re apart during summer camp. A popular thing to do is to leave a letter for your kid with a cabin leader on opening day. When your kid gets this letter it should help ease your kid into this separation. Writing to your kid feels great and it feels even better (thought it may not happen that often) to get a letter back from camp. Whether your kid’s camp is near home or not, it’s guaranteed to feel extremely far away from home to your kid. Camp, though fun and awesome for a kid, is a strange, new place that feels very far away. A letter from you makes things seem a little closer. Letters to your kid should be positive and upbeat. Kids aren’t good at communicating, at least not by mail during their summer camp stay. They have so much to do that’s right there in front of them and ten times more fun than writing a letter home. But they’ll greatly appreciate a letter from you! Next week will conclude this month’s series on what do to help take care of your ‘childsickness’. Tune in next Tuesday and, as always, thanks for reading.